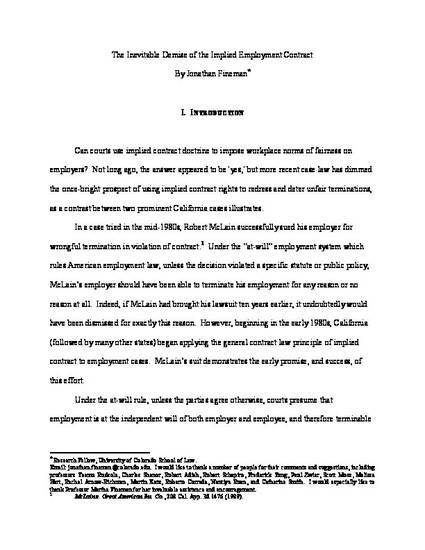 The Inevitable Demise of the Implied Employment Contract By Jonathan Fineman Abstract This article examines the consequences of the courts’ decision in the early 1980s to apply implied contract doctrine to employment relationships. Although courts did not use the rhetoric of “norms” popular in academic discourse today, their actions were in fact an attempt to enforce workplace norms, specifically the voluntary system of job protection policies employers devised in order to increase worker loyalty and productivity. I explore a question not previously addressed in-depth in the literature: what happened when courts began giving job security practices the force of law? I argue that the results were not what the courts intended. Employers immediately began restructuring their employment documents, policies and practices to avoid liability. Through a process of trial and error, employers eventually found a way to essentially avoid liability through careful drafting of personnel documents. Not only are implied contract claims now essentially impossible to win, many employees no longer have the benefits of the voluntary system of job protections that were previously in place. I further argue that the failure of contract law was inevitable.  Because the terms of the employment “contract” are typically controlled by employers, they can restructure the terms of the agreement to avoid obligations. If the contract is clear, courts must enforce it absent extraordinary circumstances, even if the terms are not fair to employees. As long as individual employers are able to define the scope of their own obligations, efforts to enforce workplace norms through contract law will be unsuccessful. Finally, I build on some existing proposals and suggest directions for future work. To successfully enforce workplace norms, we must remove employers’ unilateral ability to restructure the employment relationship to avoid liability. I suggest looking beyond the relationship between the particular employee and employer to broader-based norms prevalent in the industry or applicable to the type of job position at issue. Essentially, I argue that employers should not be able to opt out of the norms followed by similarly-situated employers dealing with similarly-situated employees. This aggregate norm approach would allow greater flexibility for employers than contract obligations but still protect reasonable employee expectations.